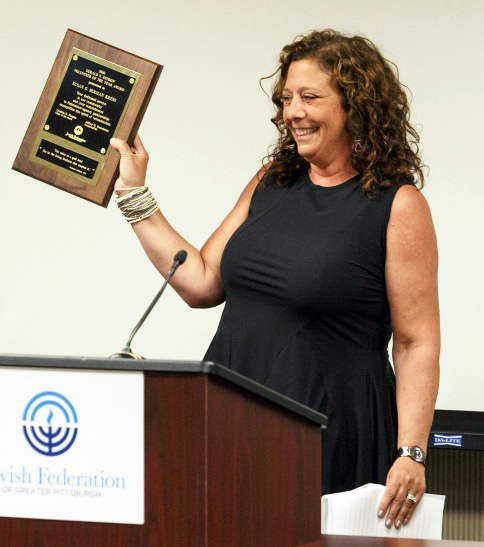 Jewish Federation of Greater Pittsburgh has named Susan G. Berman, PhD, the recipient of the Gerald S. Ostrow (z”l) Volunteer of the Year Award. This award recognizes the special efforts of a volunteer leader who has dedicated significant service to the community and has fostered partnerships among the Jewish Federation and its agencies. Dr. Berman received the award at the June 20 meeting of the Federation’s Board of Directors. Dr. Berman has served as an officer of the Federation Board and as a member of the Federation Executive Committee. In her role as chair of the Planning and Allocations Committee, Dr. Berman played a vital role in determining community giving priorities. She has served on the National Young Life Leadership Cabinet and the Federation’s Community Scorecard Committee and chaired the Jewish Community Life Commission and the Young Adult Division. A graduate of the Wexner Heritage leadership program, Dr. Berman has served as president of the Board of The Edward and Rose Berman Hillel Jewish University Center and as a board member of the Jewish Healthcare Foundation. She has been an active fundraiser for Jewish Federation of Greater Pittsburgh’s Annual Campaign. The Gerald S. Ostrow Volunteer of the Year Award recognizes an individual who has devoted a significant amount of time over a number of years in service to the community. This individual has served in a variety of capacities in both the Federation and one or more agencies, demonstrated an understanding of and dedication to the mission of the Federation and the agencies, and supported the Federation Community Campaign by making quality commitments and completing campaign solicitations.